This is a reprint of my review first published on Three Men on a Blog in December 2010, with a number of significant revisions. You can read my original review here. In the words of actor John Rhys-Davies, "Part One was a damn wonderful film. You ain't seen nothing yet." The Lord of the Rings: The Two Towers is every bit as brilliant than its predecessor, if not slightly better in some respects. 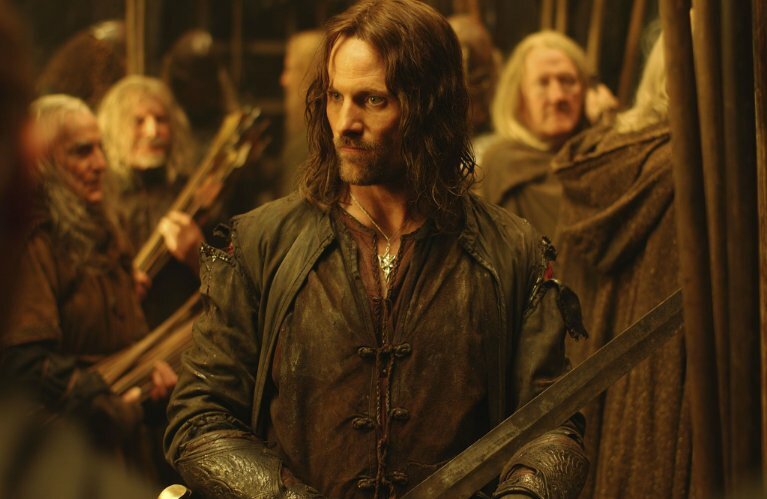 The stakes are raised and the story is darker, but it's also a film which demonstrates Peter Jackson's knack for balancing multiple storylines, serving up eye-popping spectacle while keeping an unshakeable grip on the substance he introduced in The Fellowship of the Ring. Where Fellowship took its time to set up the world of the hobbits and flesh out the backstory surrounding the ring, The Two Towers doesn't have any kind of initial exposition or recap to pull us back into the story. It doesn't need to: the opening sequence, which takes us back in Moria and shows us what happened next, is as heart-in-mouth as you could possibly want. It pulls us back into Middle Earth without simply retreading old ground, so that by the time that Frodo awakes from his dream, we know exactly where we are and are raring to go. A common claim made about trilogies is that the second and/ or third instalments do not stand up as films in their own right. But Two Towers defies this, feeling every bit as well-crafted and distinctive as the first film. 'The Lord of the Rings trilogy' is a misnomer, since Tolkien wrote it as one book which was then split into three by the publishers. This is not a trilogy of one film with sequels, like Harry Potter or The Chronicles of Narnia. It is the second part of one story, and all three parts blend together seamlessly. It is this seamless progression from one book to another which made it sensible to shoot the films simultaneously, and is also this quality which allows Jackson's more obvious creative decisions to work. The single biggest change is that Frodo's death-defying encounter with Shelob is delayed until the start of the third film, confounding expectations of those who had read the book. In other circumstances this would have been a costly error, but the level of skill present on screen leads you to implicitly trust the filmmaker, so that even when there are noticeable alterations they remain within the tone of the film as a whole. As before, the film's production values are superb. Every prop, costume and item of set is meticulously detailed and beautifully ornate, absorbing you as a spectator and making you feel immersed in the cultures of Rohan and Ithilien. The difference is that these designs now have to contend with far more kinetic and larger action set-pieces than anything in the first film. If Fellowship laid the groundwork for both the story and the scale on which it would take place, the second film builds on these foundations and flexes its muscles to show what can be achieved. 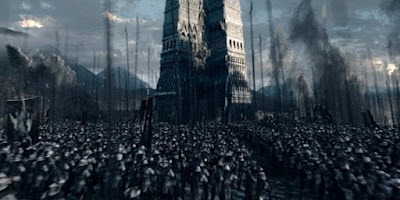 To create the Battle of Helm's Deep, Jackson and his production team created a computer program called MASSIVE, which entails creating hundreds of individual CG figures each capable of independent thought. This makes the battles more believable, with battalions of otherwise faceless armies taking on individual qualities, if only for a moment. The merging of CGI with reality is every bit as convincing as the amphitheatre scenes in Gladiator, but the organic effects are also terrific. Treebeard has all the physicality which comes from animatronics but none of the jerky drawbacks, and the continued use of forced perspectives works as well as anything on Eternal Sunshine of the Spotless Mind. Two special effects stand out in particular. The first is the de-ageing of Theoden, where the zombie-like king of Rohan loses 40 years in a matter of seconds. Not only does his hair recede and change colour, but the entire structure of his face is subtly altered, and yet it feels as tactile as the make-up he wears at the beginning. The other, of course, is Gollum. 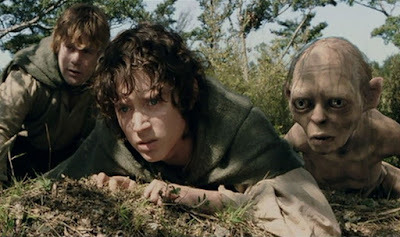 Like the introduction to Hobbiton, this was a death-or-glory moment for the trilogy; since Gollum is one of the connecting pieces in the story, if we did not accept this portrayal than all would be lost. But Andy Serkis succeeds with effort to spare, putting in a tireless performance and truly inhabiting the character. The Two Towers is a darker, more threatening film than its predecessor, a mood which is brilliantly conveyed in its battle scenes. Being a 12 certificate film, we are still in fantasy violence territory; the focus is on the suggestion of injury rather than lingering on blood like Gladiator or Braveheart. For all the spearings and decapitations, which again hint back to Jackson's horror past, the focus on violence is briefer and when individual pain is addressed (as with Haldir), it is largely implied. But despite the scale and the huge number of characters, we still feel a huge emotional attachment thanks to Jackson's camera positions and the rhythms of the battle, ensuring that the characters' pain and fear is very real. The film is also thematically rich, drawing on Tolkien's concerns about the destruction of the natural world and the potential enslaving of mankind through machinery. Tolkien consistently emphasised that his work was not allegorical - he found the device irritating, baulking at his good friend C. S. Lewis when he used it to great effort in the Narnia series. It's tempting to substitute Sauron and Saruman's armies for the Axis powers of World War II - in light of the period in which the book was written - but to do so is to grossly oversimplify and reduce The Lord of the Rings. What is certainly true is that Tolkien's experience of World War I runs throughout his writing, with his characters struggling through seemingly hopeless situations and good people being twisted into evil monsters despite their best intentions. This film places a neat twist on the theme of nature and machines clashing for the future of humanity. In the first film, the machines had it all their own way, but with the arrival of the Ents, the "shepherds of the forest" who in turn control the trees, nature is beginning to fight back. However, as the war turns the way of greenery on one front with the flooding of Isengard, at the other end the machinery of Mordor is making mincemeat of the divided forces of Gondor. In the middle of both these conflicts, you have man and machine locked in combat for the control of the world. The central battle, between Frodo and the ring, stands on a knife-edge, and it is increasingly unclear as to who is controlling whom. 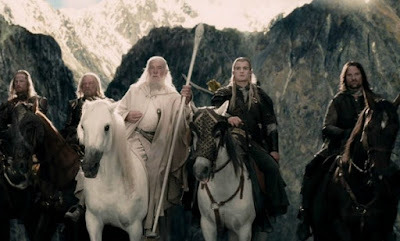 As before, the beauty of The Lord of the Rings is its harmony of the epic and the personal, with all parties caught up in a conflict which is both physical and metaphysical. As with Fellowship, what really sticks with you after many viewings is the film's note-perfect marriage of darkness and light. In light of its imitators (some pleasant, some not), we depict it as wholly dark, bleak and brooding in a bid to drum up its heft and credibility. But there is a lot of humour laced among even the darkest scenes. The rivalry between Gimli and Legolas is beautifully judged, and the scene of the latter killing soldiers while using a shield as a skateboard is straight out of Bad Taste. Even Sam's speech at the end about the 'great stories', which teeters on 'message moment' schmaltz, works as an expression of hope amidst a gathering storm. The Lord of the Rings: The Two Towers is every bit as magnificent as its predecessor, if not slightly moreso. Like Mad Max 2 or Evil Dead 2, it builds on everything that was brilliant in the first instalment while carving out its own identity. Howard Shore's score is brilliant, especially in the dream sequences with Arwen, and Jackson's direction is note-perfect, beautifully judging the emotional impact of every last shot. Whether as a brilliantly constructed epic, a fascinating or an intimate story of struggle and temptation, there is something here for absolutely anyone.